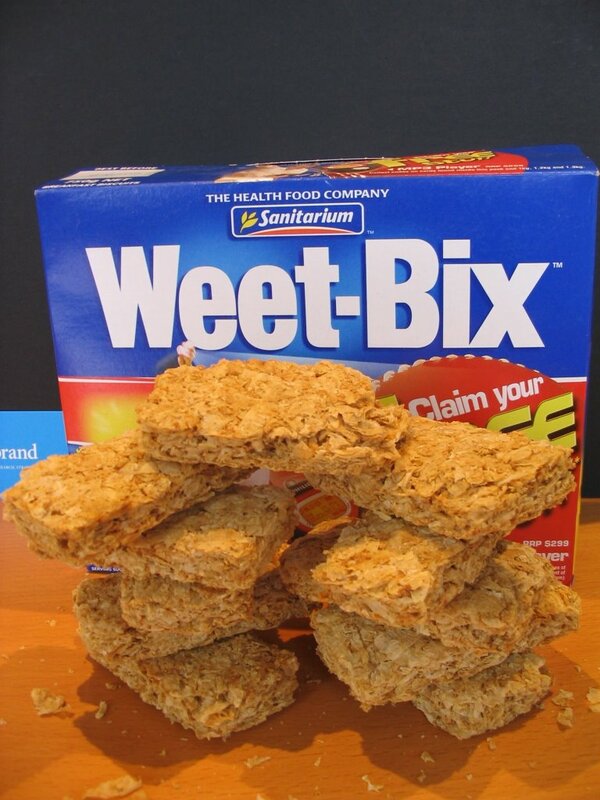 Sanitarium is doing the brand consolidation and extension thing with Weet-Bix, another Aussie brand icon (see our earlier blog entries re Twisties and Kit Kat). 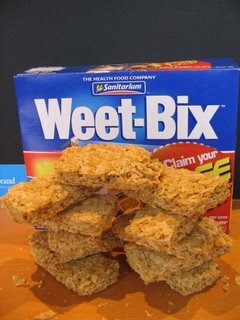 Several existing Sanitarium breakfast products have been re-branded so that they now reside more clearly under the Weet-Bix umbrella. HI BRAN, which previously carried only a small Weet-Bix "endorsement", is now clearly Weet-Bix Hi-Bran. Good Start, which previously carried no reference at all to Weet-Bix, has been re-branded Weet-Bix MULTI-GRAIN (that's if you can find it - they were out of stock at two Coles supermarkets this weekend). At the same time, Sanitarium has launched three new Weet-Bix brand extensions. First, there's Weet-Bix Crunch, which consists of sickly sweet mini-sized Weet Bix described as "bite sized pieces packed full of energy and blasted with honey". Then there's Weet-Bix KIDS, a product line created especially for 1 to 5 year-olds and heavily co-branded with The Wiggles in its packaging and promotion. Third, there's Weet-Bix Organic. Strangely, a low sugar, low salt version of breakfast biscuits that look identical to regular Weet-Bix are still called (uninspiringly) Lite-bix. Consolidating a wide variety of products under a single brand is based on the presumption that this configuration will optimise the economic benefits from leveraging brand equity. I think it's reasonable to assume that the Weet-Bix brand can carry a broad range of sub-brands, although I do hope Sanitarium has done its homework (i.e. well-constructed consumer research) on this front. But re-branding itself carries a number of risks. First, some consumers may think the re-branded offering is no longer intended for them: it's possible (for example) that some consumers actually preferred Good Start because it wasn't Weet-Bix (e.g. the slogan "Aussie kids are Weet-Bix kids" suggests to them that Weet-Bix is not a brand for adults). Second, and perhaps most obviously, loyal customers may not recognise or be able to find the re-branded product, and/or they infer that the new version has been re-formulated. The most instructive instance of this in recent years was Lipton's disastrous 2002 re-branding of its regular tea as "Black Tea", which necessitated a costly and dangerous advertising and in-store rescue campaign (see this report from B&T) and RE-re-branding. I say dangerous, because Lipton's message that Black Tea was "the technical term for the tea you love" sounded condescending and was interpreted by some consumers as implying that any confusion was their own fault for being ill-informed about tea... or just plain stupid.